For the second time, DPD has ordered VPC to correct and re-submit floor plans for its proposed land-use change. The restaurant’s recently submitted plans (requested from DPD in Dec., 2010) omitted correct building plans for the 2nd floor. VPC set up an office where legal use allows only for a studio apartment or similar residential use. The improper office is still in use. 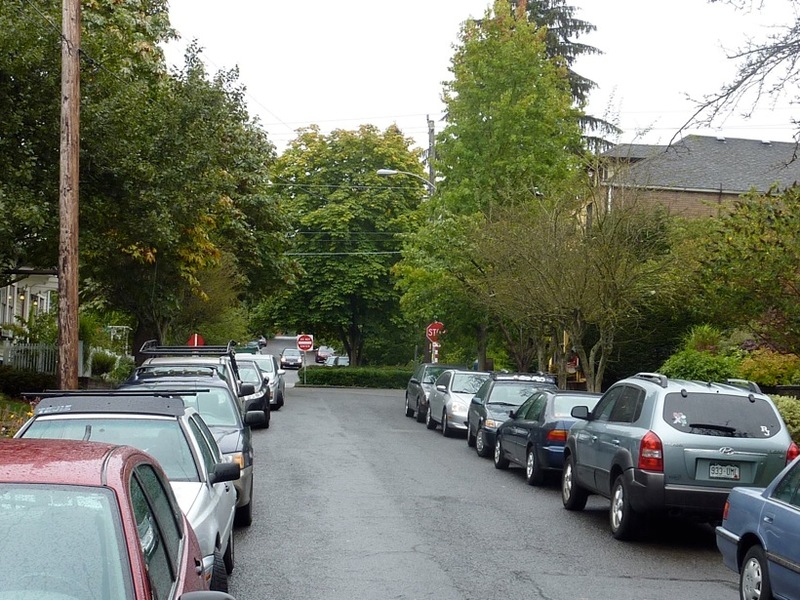 DPD (Seattle’s Department of Planning & Development) also is reviewing a Parking Study it requested from VPC in mid-November, 2010, (submitted on March 14th, 2011, with the above-mentioned corrections of floor plans). DPD stated it needed such a Study to compare parking impacts of the small grocery (that existed until 2002, as the last legal use for the building) with that of the proposed use (the restaurant now operating illegally). VPC’s study doesn’t attempt to compare the actual parking demand of VPC to that of the defunct grocery. in an urban setting, a small grocery or convenience store generates about half the parking demand of a small restaurant. the City’s zoning laws are supposed to protect homeowners against a big increase in the impacts caused by a business “grandfathered” into a residential neighborhood. You can read the most recent correction notice here. The document is public record. Today, The Department of Planning & Development (DPD) gave VPC a deadline of March 15 for the site plans it requested in early Dec., and for the parking study requested in mid-November. DPD doesn’t set such deadlines unless an applicant is delaying the process. DPD determined that both elements were insufficient in the Condiitonal Use Application VPC filed in September. Documentation such as traffic counts and photos demonstrate impact or lack of impact. Our photos (below) document some of the impacts neighbors are asked to bear as a result of VPC’s current restaurant. You can view additional documentation here and here. 17th Ave E on 10/9/10 (VPC open). Gray roof on right is VPC. In May of 2010, the DPD found VPC in violation of their land-use, which allows a ‘grocery.’ Since 2007, VPC has been illegally operating a restaurant. In Sept., after missing two deadlines, VPC filed a Administrative Conditional Use Application, requesting a land-use change. The document requires VPC to demonstrate that their proposed use (‘restaurant’) will cause no more impact to the neighborhood than the current use (‘grocery’). Currently, VPC illegally operates the restaurant they are proposing in their CUA. This complicates matters. DPD has allowed VPC to continue to operate as-is until the land-use is resolved. DPD has since asked VPC for the two corrections (described above) to their CUA. 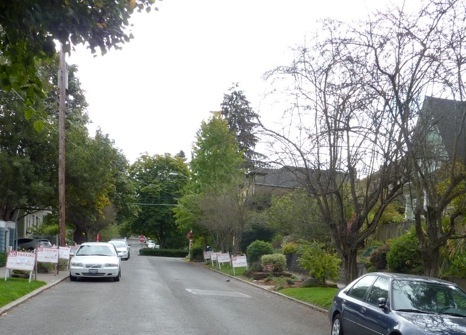 The Department of Planning and Development has requested that Volunteer Park Cafe provide a study that will compare the neighborhood parking impact of the previous legal use (a grocery store) to that of the restaurant. UPDATE: Due to lack of compliance by VPC, on Feb. 15th, 2011, the DPD gave VPC a firm deadline of March 15th by which to submit the parking study. “The parking counts should be made during the expected peak time for the restaurant, and counts should be collected on Monday, when the restaurant is closed, and at the same time on a Tuesday, Wednesday or Thursday, when the restaurant is open. Additionally, parking counts should be made during the expected peak time on either Saturday or Sunday. No due date has been set for the study. In its original application to DPD, VPC doesn’t discuss differences between the parking demand for a small grocery (the only current legal use for VPC’s space) and the destination restaurant VPC has become. VPC contended that the majority of its clients arrive via foot, bike or bus, but didn’t explain how it arrived at this estimate. We believe this action demonstrates that DPD values public comments that pointed out the variety of traffic and parking issues VPC has caused. The obvious downside is that this request delays decision-making at DPD. *The request appeared on DPD’s website on Nov. 27th, but was dated Nov. 17th. Quarterly neighborhood meeting on June 25th – Join us!